BATON ROUGE — In the 1950’s — in the days of football greats Jimmy Taylor and Gus Kinchen (Baton Rouge High) and Billy Cannon (Istrouma High) — Baton Rougeans filled Memorial Stadium to capacity and beyond, sometimes more than 18,000 fans for a high school football game. The three football powers were Istrouma, Baton Rouge High, and sometimes Catholic High. They played in the highest classification — then AAA. Epic battles were waged against schools such as LaGrange, Bogalusa, Terrebonne, Jesuit, Warren Easton, Bolton, Byrd, and even State Champions from other states, such as Nederland, Texas, and Pensacola, Florida. The power and intensity of the rivalries and the game day atmosphere compared favorably with the best in America. Will those days ever return? Probably not. In those days, the top schools were much larger than schools are today. For example, Istrouma had 1,850 students in the 10th, 11th, and 12th grades. This resulted in intense competition and a high quality of athlete. The 1962 Istrouma state championship team had 15 seniors who won college football scholarships. Today, the demise of the East Baton Rouge Parish school system and the rise of private schools and new community school systems have resulted in many more high schools with smaller student bodies. On the other hand, the Baton Rouge area has far more student athletes playing football today than it did in the 1950’s. An All-Parish team of today could probably compete very well against an All-Star team of the 1940’s, 1950’s, or 1960’s, except perhaps in the mid-1950’s. So what does high school football today have to offer? A lot! The competition is more even, and anything can happen and often does. Example: Two Fridays ago, I arrived at Redemptorist Field on Plank Road around 9:15 p.m. just in time for the third jamboree game of the night, which was between Catholic High and St. Michael’s. It was raining cats and dogs but no one was leaving the stadium. The Catholic student section was packed with at least 500 students, all of whom were screaming and carrying on with an intensity that surpassed anything I remember from the 1950’s or 1960’s. They never let up throughout the game, even when the Bears fell behind. Across the way, St. Michael’s was just as packed and perhaps even crazier. The rumble and roar of the crowds was infectious. The cheerleaders on both sides performed with intensity, and the bands played on and on. It was as exciting a high school game as I have ever seen, and it was only a jamboree! 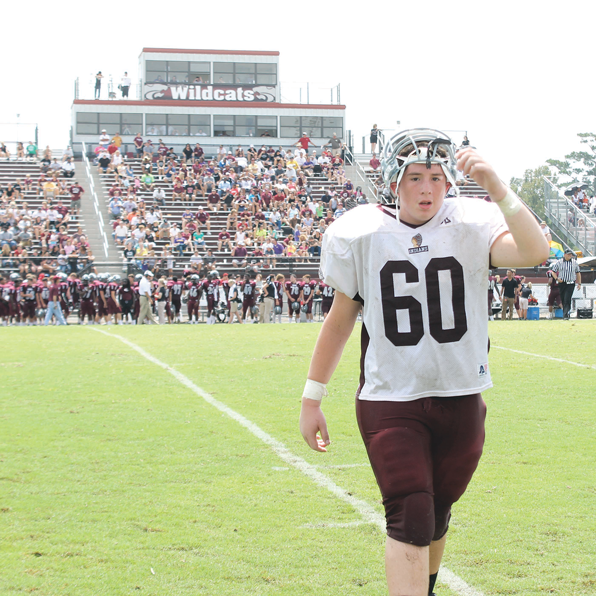 High school football in the parish is far more exciting than the college or professional game. Everyone who loves prep football should read Robin Fambrough on the Advocate sports pages. She does a masterful job. One disturbing thing is the plight of some of our inner city high schools. At some schools, few parents attend games, and crowds can be sparse. The kids at those schools are getting good mentoring from their coaches but many of them need more father figures in their lives. Hank Henagan, Istrouma Class of 1966, is one of those who still goes back to his old alma mater to mentor the youngsters there. If you’d like to help, call Hank at 225-229-6839.